Available January 2 at Noon CT through January 31 at 11:59 p.m. CT, or while supplies last. We all experience stress and emotional ups and downs from time to time. Mental illness goes beyond these ups and downs. Gratefully, with the proper treatment and help, those suffering from mental illness can live a happier, healthier life and to its fullest potential. Origami Owl® wants to give back and tell others, “You are not alone,” with our “Find the Silver Lining” Living Locket® look! 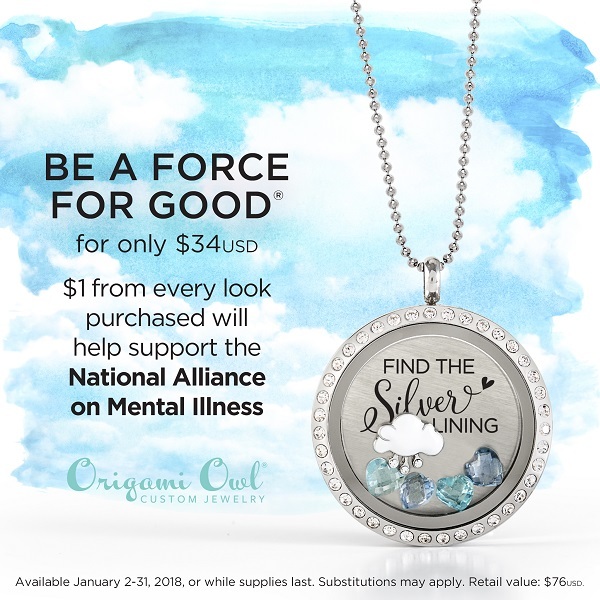 Origami Owl will donate $1 from every Force For Good Locket look purchased to the National Alliance on Mental Illness in the U.S. and the Canadian Mental Health Association in Canada. These organizations raise awareness and provide support, education and advocacy to those experiencing mental illness, and to their families. Rain Cloud Charm – Early Release from our Spring 2018 Collection! Large Silver Living Locket® with Crystals – Exclusive! Large Silver “Find the Silver Lining” Plate – Exclusive! 2 March Heart Birthstone Charms – Exclusive! 2 December Heart Birthstone Charms – Exclusive! You can find all your shareable social assets and flyers under “Monthly Exclusives” and “PDFs” in your My O2 Connection mobile app and the desktop version in your Back Office under Designer Resources > My O2 Connection. Here are FAQs about our limited-time Force For Good look. If there’s a cause you’re passionate about, no matter what time of year it is, you can hold a Force For Good Fundraiser! You can find the Force For Good Fundraising Toolkit in your Back Office under Designer Resources > Force For Good. We have everything you need to hold a successful fundraiser including email templates, call scripts, a flyer and social assets.